Background: My family owns a cart in the market at Ferryport, my father sells produce and my mom has herbal remedies. I discovered my magic ability while traveling to new regions to find exotic ingredients for my families cart. I am seeking adventure to get an opportunity to hone my skills. Characteristics: Dreaded, Storytelling, Self-Claimed Bardic Virtuoso. An ongoing RPG show following three adventurers in the dark lands of Atheles. Ferryport and the surrounding areas. Starring: Laura Bielaczyc, Hannah McGinnis, Anton Souvorin and Michael Bielaczyc. Based on the SagaBorn Roleplaying Game and the Dark Return Setting. Ada fidgeted. The room was comfortable enough, books everywhere, large tables, leather backed chairs. But she was nervous. She pulled on a loose string on her scarf, and then her brow furrowed as she knew this would just cause it unravel more. Ada smiled, “I’m not nervous.” But the tone of her vice betrayed her. Had she made a mistake signing up for the Wanderers? Was she meant to be an wandering soul, lost on the roads of Atheles? Her parents had not been overly excited, but they had been supportive. Jobs with the Wanderers could bring a level of income that could make her and her family comfortable. But not without risk. “Ah yes, hail there Bergamot. Yes, have a seat, we are waiting for one more.” the elfling pulled around another large leather seat near Ada. Another man walked in from an adjacent room. He was older as well, his face wrinkled and scarred. His leather vest showed travel stains, and as he gripped a chair behind a large desk, Ada saw he was missing a couple of fingers. “I think you have a couple more good years left in you Bergas.” He said with a half smile. As Bergas started to retort, the door opened and closed, though it seemed no one entered. 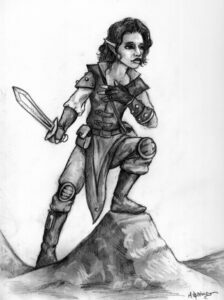 Ada sat up and peered over a tall pile of books to see another elfling, this one a younger woman, standing in front of the door. She stood in a wide stance, her hands on her hips. “Ok, I’m here. The adventure can start!” she belted out in a high pitched voice, which was followed by a broad smile and a laugh. “And Ale!” Bergamot interjected which caused a laugh to escape Xyla and Bergas. “And finally this is Ada. She is from here in Ferryport, but she is looking for a way to help her family in these difficult times. And, knowing a bit about her skill set, she is probably in need of stretching her legs and discovering a bit about herself away from the oppression of the city.” He stood and walked about to the front of the desk. “Now each of you has something that sets each other apart, and something I felt meshed well with another in the group. None of you seem hung up on prejudices and small mindedness that seems so rampant these days. And I sensed a loyalty in each of you. The path will not be easy for you. Each of you stands out from what many consider normal, so you must look out for each other. And, if you pass this first test, the Wanderers will look out for you as well.” He leaned back against his desk and ran his hand through his gray hair. Ada’s head started to spin a bit. Today. Today you leave the comfort of your home to see a larger world. So many emotions. Excitement, fear, joy all tumbled over each other in Ada’s stomach. She knew Bishop was still talking, and Xyla and Bergamot were already chatting together about what their favorite haunts were along the road to South Hollow. Did Bishop just say something about an adventure board? It didn’t matter. The Vale is the home of the Alfiren, or Elflings. It is located in the Westlands, southwest of Ferryport. 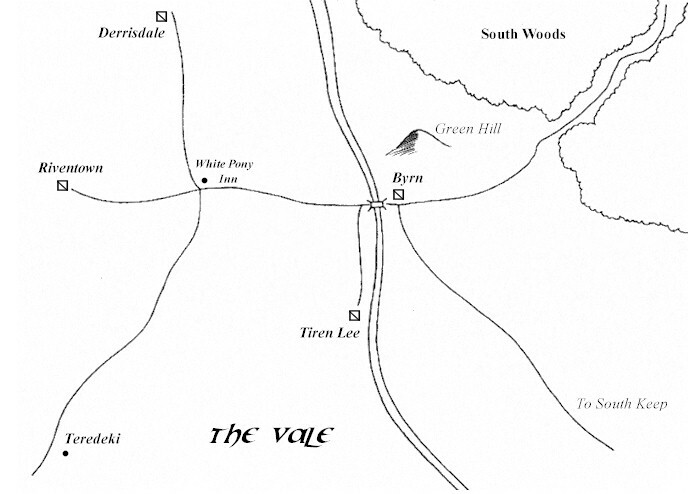 Long ago it was considered part of the kingdom of Bordon, but as the kingdom slowly divided, the Vale became its own land. In the Third Age the Vale was the easiest way of travel from the city of wizards in the west southwards. 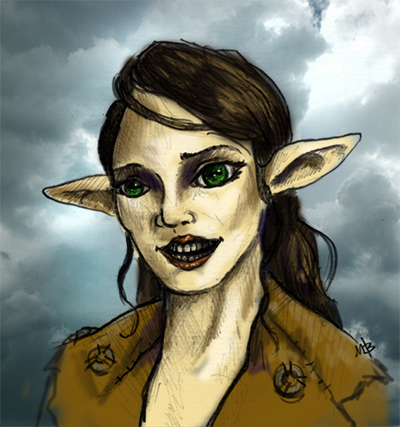 The Elflings were discovered then (and named such as to their resemblance of their larger “cousins”). The wizards were uninterested in them from the start and the King of Bordon named Terrin Vinestock the first lord of Vale. Not knowing or caring what his new title bestowed them from the larger people, they Vale continued much as it had, save that the roads had to be widened and some inns along the way had to be built to allow for bigger folk. The population of the Vale and its size does not increase much, though it would be hard to tell, since due to expanded roads, the Elflings have been able to indulge in their favorite pastime of traveling more than ever. Some theorized among the Elflings that better roads would make it easier for those who left to find their way back, but it has only seemed to allow them to travel further away. Some other speculate that another great gathering of Elflings has occurred somewhere, which is why many have not returned. Many of the peoples of the world are welcome within the Vale, though they have become a little more cautious as time has gone on. Alfiren homes are built in the stands of trees that dot the landscape of the Vale, separated by hills and open fields. They often build these simple but sturdy structures right up against the trunk of the tree and use the roots as stairs or even furniture inside the home. This is not merely done out of convenience, but is borne of what they call a “respect for the chaos that is nature herself.” Their construction reflects this chaos of nature rather than distorting it into the straight lines and perfect angles of human construction. They are an agricultural society, but they eat so little that their stores rarely run low, and excess is shared freely with any needy outsider willing to transport it home. They have large fields of shared honey bee colonies and partially domesticated cows. Their fields are rampant with berries which the Alfiren harvest and turn into various berry wines, of which they drink often. Their honey mead is well known throughout the Westlands, though the supply has often fallen far short of its high demand. All of this lends itself to a very unusual, yet beautiful, landscape. Immense open fields are dotted with cows meandering aimlessly. Large wooden boxes house thousands of bees, which can be seen flying from flower to flower across the multicolored hills. Large patches of trees spring sporadically from the ground, surrounded by honeysuckle and wild berries. Mixed among all this beauty, young Alfiren play among the flowers, and the older ones watch over them with a caring eye while going about their daily business. To outsiders, Xyla may be similar to any other elfling, but among her people, she is a radiant beauty. Her laugh and smile disarm many she speaks with, but she is also vicious if provoked.